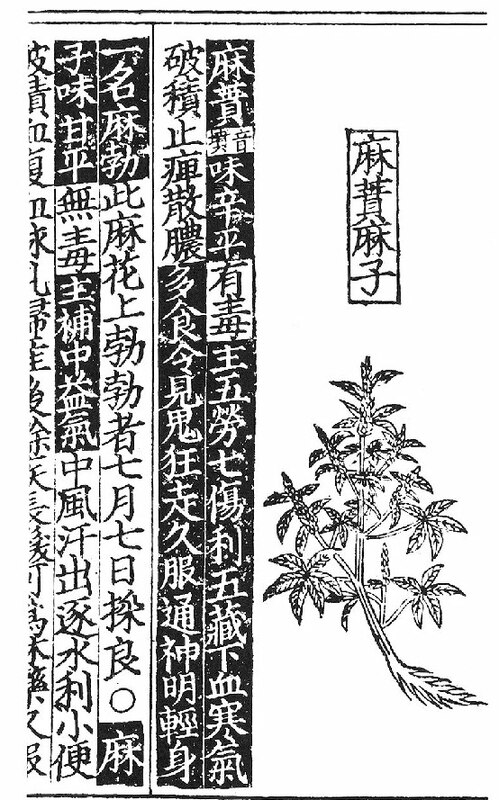 HEMP - page (with illustration/medical description) of hemp plant from the [1234 AD Edition] Cheng-Lei Pen-ts’ao*. [1,2 ] Medical Cannabis [3,4] stop eating [4,5] let go [eat more] [9-12] you will see white ghosts  walking around [14-20] and eat long enough, you will know how to talk to the Gods. Plant has grown and is good on July 7th, when plant can be picked. (Note: The hemp plant grows to maturity within 2 to 6 months, but usually in 4 months. Given the fact that planting season is probably (after winter) in February, this statement should actually translated as -- The plant should be picked just at the right time of maturity). Skin . . stomach . . . forever . . . women . . . with baby . . . long hair . . . can be . . . medicine . . time. WARNING: -- As will be shown in another section, Chinese makes us of the concept of ‘Compound Words,’ or two different words that when put together, form a totally third concept. Additionally, cultural language usage must be taken into account. Medica Sutra . . . etc. . . . The origin of the Chinese pharmacological book "The Herbal", has been lost in history and is now the subject of numerous myths and legends. The most colorful one being the one that the Red Emperor Shen Nung (2,000 BC) was its originator. But WARNING: No actual pre-50 AD, original copies of Shen Nung’s ‘The Herbal” are still known to exist. The earliest known copies (something that can pass a radio-carbon dating test), are only approximately 2,000 years old, written sometime around 50 AD. However, logic dictates that it would have been impossible for such a book (which literally lists hundreds of herbal medicines), to have simply sprang up overnight. It obviously was taken from historical sources and additionally these editions are said to acknowledge their actual origin. The presently used version of the Pen Ts’ao was actually written (or re-edited) by the great medical textbook writer, Li Shi Chen (1517-1593) ---- The following version Chinese/English (1936) consists solely of a reference list of its basic medical drugs. *At the present time, the museum is trying to obtain an actual translation of the 1234 Edition.